We managed to do some sea kayaking while back in British Columbia. First we made a trip to Pender Island and did a three hour guided tour with Kayak Pender Island. It's a nice little outfit and easy to get to; there's a direct ferry from Swartz Bay. On the other side, you can just walk there from the ferry terminal. The highlight of the paddle was going past a small rocky outcrop that was home to several harbour seals and their pups. 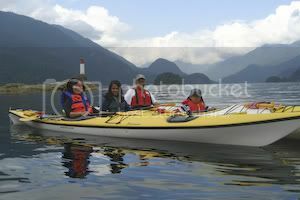 About a week later, we went kayaking with a friend in Deep Cove, Vancouver (thanks Willy!). That's where we are in the picture. It's amazing that this beautiful peaceful area is only minutes from the city. I'm not sure the kids enjoyed the paddling that much but I did. K* was happy for me to do all the paddling. R* finally got her own kayak on the second trip but then found it was a lot of work.